True passion is essential to making great shoes. From drawing the first sketches to presenting our finished shoes in ECCO stores around the world, we apply the utmost attention to detail and quality. Unique to our industry, we make leather at our own tanneries and produce shoes at our own factories. Our global family of employees, representing over 50 nationalities, is the life force behind our products. Design, development, production, and retail – we take responsibility all the way. 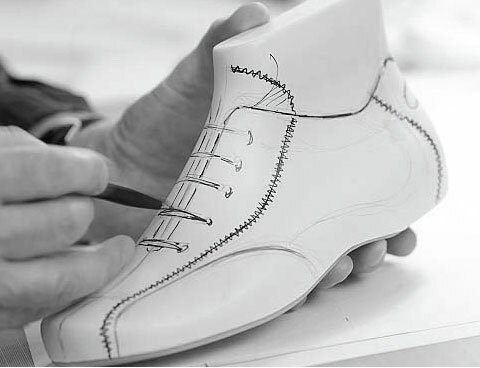 Throughout our history, our philosophy has been to make shoes that are shaped to fit the foot, not the other way around. This is who we are. At ECCO, we believe in controlling our processes and checking our products down to the smallest detail. From design and leather craftsmanship to production, quality testing and sales, ECCO controls every step of the shoemaking process, ensuring the high ECCO quality. A household name in Europe and America, ECCO shoes are distributed in almost 94 countries around the globe. ECCO is one of the largest producers of casual shoes in the world. It is also one of the few companies in the footwear industry to have achieved full vertical integration – upstream and downstream. ECCO controls the entire process: sourcing and production of raw materials, design and development of products, manufacturing, distribution and sales. The end product is delivered to more than 1,002 ECCO shops, or 3,792 conceptual points of sale. Conventional shoes fit across your feet at the toes, restricting the way your toes spread as you walk. ECCO's Freedom Fit is different; it offers a roomy toe box and fits more narrowly from heel to instep, suitable for most widths. Toes spread naturally to support your weight and foster a more comfortable walking experience. Feet of nearly all widths feel good in ECCO, comfort straight from the box. Our unique freedom fit allows the foot to control the shoe, not the other way round. We persistently innovate to create shoes that are softer, suppler, lighter and more like the foot itself. Scandinavian lifestyle is defined by being balanced and active. Every ECCO shoe - whether it is a business shoe, a sneaker or a high heel - is designed to free wearers to step into whatever moment life offers them. We have become the world’s most consummate practitioner of an advanced shoemaking process called Direct Injection (DIP). This allows us to create shoes that fit closer and more accurately. It also helps us in enhancing a shoe’s ability to match the natural movement of the foot. The essence of modern life is the capacity to move from one activity to another, from one place to the next with ease and confidence. We make shoes that make this possible.